Irish Garden House: Fence Pick . . . Fence Pick . . .
2-3 small dogs, a pinch of a brook, and add some pebbles. a sky of deep blue and bake in the sun. When brown, set away to cool in the bathtub." Hello, sounds just wonderful. Beautiful fence shot. Happy Thursday, enjoy your day! Sounds like a wonderful recipe...Pretty fence..Have a wonderful day.. This shot is so perfect for so many reasons. I see no weeds, it all looks so neat and well gardened. Love the contrast of the brick color. Love the flowers and the words! a pretty little scene and I like the poem/reading too. 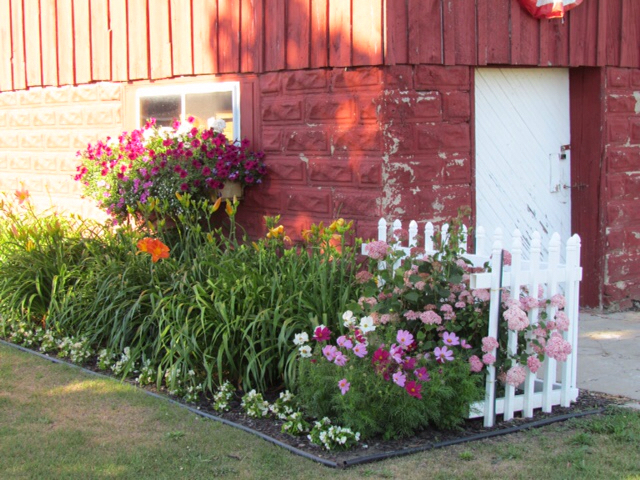 That is a beautiful little corner fence and flowers. So pretty to look at.